First, let me introduce myself. 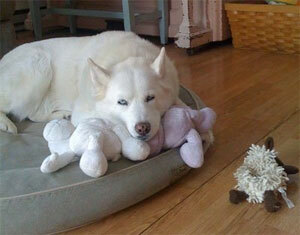 My name is Scout and I am a Husky mix of sorts ~ I am also Chloe’s brother. Chloe has been writing this blog for a couple of years now and I’m very sad to say that I must now take over the responsibility because my sis has passed away. Chloe had been sick since August 2010 and nobody knew what exactly was ailing her. She would have good days and bad days ~ we all kept hoping she would get better. The last week she was with us had been a roller coaster for us. She had started out the week on a good note ~ gained almost 2 pounds which was badly needed and she was eating pretty well. Wednesday night and Thursday morning, it took a little more coaxing to get her to eat enough for her insulin (she had been diagnosed a diabetic in July 2010). Thursday morning, my mum took Chloe to the vet for some x-rays to make sure that nothing was going on inside. The vet didn’t really see anything to worry about and sent Chloe home with a bunch of different foods to try, but there really wasn’t any need ~ she ate 2 cups of dry food, without any coaxing. Mum was ecstatic. By 11 am the next morning, things were much different for Chloe and by 7 pm that night ~ she was gone. Chloe wouldn’t eat and couldn’t even keep water down. She was clearly suffering and she couldn’t fight anymore, so mum held her close while she went to sleep. She was gone quickly. We miss her terribly. She was our leader and she kept us boys (me and my brother, Niko) in line and always corrected us when she thought we were wrong. She was a strong presence in our house and now there is an obvious void. She will forever be in our hearts.